Telegraph lines in the south-east region. The south-east area is defined, for the purpose of analysing the development of the telegraph lines, as being south of Campbell Town (so below the Fingal-St Marys line) and east of the main Hobart-Launceston line. In early April 1875, newspapers and the Government Gazette carried advertisements as: "tenders will be received up to noon on the 16th April for erecting poles and constructing line of telegraph from Postville via Richmond, Sorell, Buckland and Spring Bay to Swansea". The first construction in the south-east region began in late 1875 of early 1876 - a little after construction started in other areas. This delay was partly because of the dire financial circumstances of the Colonial government and also the need to spend funds on areas with mineral discoveries which would in turn assist the Government's position. In January 1876, a line was constructed from Richmond to Buckland, Spring Bay, Lisdillon and Swansea with Telegraph Offices opening as required - for example Lisdillon did not open until 1885. Swansea was always an important town and was the third area in the Australian Colony to be declared a municipality (after Sydney and Hobart). In addition to agriculture and grazing, Swansea was an important area for whaling. Black wattle bark was also produced there for use in tanning. Swansea, together with Spring Bay, were also important ports for vessels sailing to Melbourne and Sydney (together with Torquay and Circular Head). For example, The Mercury would carry details, transmitted "By Electric Telegraph", about ships stopping at either port (see, in 1885: 14 May, 11 June and 7 October). Another article in The Mercury on 22 March 1878 mentions (second paragraph) the use of the Telegraph Office. "Our telegraph line when open may bring us more into notice than we have been for years, and our splendid harbour may be more used by vessels, running in windbound, to report to the several owners the progress of the voyage. Of course some of our old fogies cannot see the use of the telegraph, but time will convince the most senescent representative of the above class, that the telegraph is one of the greatest pioneers of progress. Improvement must commence somewhere and it is creditable to the member for Glamorgan for bringing in the scheme as it proves that there is one energetic representative of modern ideas, even if there is a large percentage of the stand-still element. I see Mr Grubb is making satisfactory progress with the contract. The poles are of a really first-class description and superior to any that I have seen used for the purpose. I am sure that The Tribune, with all other friends of progress, will be glad when the telegraph line to here is finished for then I shall be able to flash the news of anything important that occurs at Spring Bay along the wire, on the same day that it happens, and your readers will have it at their breakfast table on the following morning". Bicheno, to the north-east of Swansea, had been settled in 1803 as a whaling and sealing centre even before the Colony of Van Dieman's Land (as Waub's Boat Harbour). It expanded and became a port for the coal taken from the Denison River area. The Victorian gold rush reversed all development with most of the town's residents leaving about 1855. Hence, when decisions were being made about constructing telegraph lines from Swansea, there was no economic and little social motivation to include Bicheno. Also in 1876, construction of a line to the difficult region where the convict settlement of Port Arthur was situated began. The Telegraph Office at Richmond was used as the branching point and the line constructed to Sorell. In 1881, it was extended to Coppington, in 1883 to Nubeena and in 1885 an intermediate station was opened at Eaglehawk Neck. As a measure of achievements, it is sometimes quoted that construction progressed so well that the telegraph line was constructed though to Salt Water River by 1900. A Telegraph Office was also opened at Tunbridge between Oatlands and Ross in 1876. Telegraph offices in the South-east region. 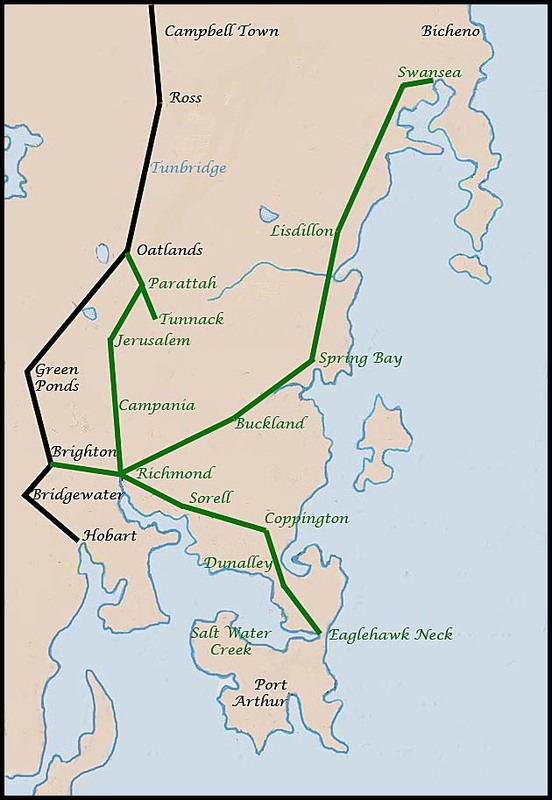 Overview of Telegraph lines in Tasmania.